You get two mailbags for the price of one this week. With National Signing Day on Wednesday, we asked for your recruiting questions and you delivered. The full Hail Varsity staff returns to answer your questions about the biggest gets of the 2019 class, what holes need to be patched in the 2020 class and which position group will become a calling card for Nebraska in the future. Greg Smith: Quarterback. Let’s say that Adrian Martinez has the type of success that seemingly everyone (myself included) expects him to have. The boost from that will be long-lasting but Nebraska already has Luke McCaffrey on campus plus Logan Smothers in the fold after that. QB recruiting and development will be elite at Nebraska as long as Frost and Verduzco are running the show. Brandon Vogel: I’m with Greg. I think quarterback is the most likely group to consistently be Nebraska’s best foot forward. That’s intriguing for the obvious reasons—it's an important position—but I’m also interested in what that looks like over an extended period. Oregon had it some while Frost was there. Northern Iowa definitely had while Verduzco was there. But what’s it look like with those two together over the course of multiple QBs? Mike Babcock: Add me to the quarterback bandwagon. When I think of Frost’s undefeated team at UCF, I first think of McKenzie Milton, the quarterback (then Shaquem Griffin). Frost was a quarterback, of course, and Verduzco knows his business. It’s a winning combination. The key will be continuing to recruit and keeping quarterbacks for the future. Jacob Padilla: I think quarterback probably has to be the answer. Even at Oregon, they had big names at the skill positions like LaMichael James and De’Anthony Thomas and Kenjon Barner, but it was Darron Thomas and Marcus Mariota that really made that offense go and as soon as Oregon started missing on quarterbacks, they fell off. Frost turned McKenzie Milton into one of the most effective quarterbacks in the country with his offense and coaching and Adrian Martinez is already ahead of where Milton was at the same stage. Martinez is setting a high bar for whoever succeeds him as the starter, but Mario Verduzco seems awfully high on the guys they have coming up the pipeline. Derek Peterson: Just to avoid the groupthink accusation, I’m going to venture out on a limb. I could really see Nebraska becoming Running Back U. Look at what this staff did with Devine Ozigbo in one offseason. He became a 1,000-yard rusher and he didn’t start a game until Week 4. Maurice Washington is next in line and we all expect him to be really good. Wandale Robinson, I think, will probably be viewed more as a running back by the viewing public than as a wideout so whatever he does will end up counting toward the room. Ronald Thompkins and Rahmir Johnson all look like guys who could be future studs. Plus Ryan Held is one of the best recruiters in the country. I expect Nebraska to be different from Oregon and UCF in that Frost knows how important the run game is here and knows how important it is in the Big Ten. I expect Nebraska to be much more run-heavy than either of Frost’s two previous stops, so while the quarterback play should, based on the track record, always be strong, the potential for Nebraska to keep cranking out elite running backs seems pretty high. GS: Offensive line, defensive tackle and cornerback are the areas I’ll be keeping an eye on. As of right now, I might give the edge to offensive line because Greg Austin is still shaping that room to look exactly how he wants it. MB: Offensive linemen are always critical, regardless of the year. DP: Yeah a wash is fine here. The trenches are critical. Bryce Benhart in 2019 is a strong starting point, Turner Corcoran in 2020 should be another. Who else is joining? I’m still thinking about Frost’s “they’re bigger than us” line from after the Iowa game. BV: Nebraska’s not short on options in my mind, they’re just mostly unproven at this point. That doesn’t mean they haven’t played, just that they haven’t really been the guy over the course of the season, but there’s a lot of upside. I look at (in no particular order) Caleb Tannor, Tyrin Ferguson, Quayshon Alexander, JoJo Domann, Breon Dixon and Jackson Hannah as Nebraska’s best candidates right now. Collin Miller could move out there, but he might be too valuable inside to do that. JP: I agree with Greg here. Nebraska’s involvement with so many outside linebacker recruits down the stretch I think altered the perception of the position. Nebraska has bodies there, they just don’t have anyone that has emerged as a true difference-maker, and I’m not sure any of these recruits they missed on would have been that early on anyway. I think Nebraska will be fine there in terms of depth as long as some of the young guys make progress. GS: Two players that I am very high on who have already enrolled are Wandale Robinson and Nick Henrich. I feel like people have forgotten why it was that Henrich was so highly ranked and recruited because he was banged up at the end of his senior season. This summer I can’t wait to see Rahmir Johnson. I think he has star potential in this offense. Erin Sorensen: I’m excited about the potential Brant Banks brings to the team. Having talked with his family, he seems like a good kid with strong work ethic and a good head on his shoulders. It’ll be fun to watch him develop with this staff. Otherwise, Garrett Nelson because he’s Garrett Nelson. That kid is going to be a major leader of this class and is sure to be fun to interview along the way. BV: After Robinson, Myles Farmer is next on the list for me. He’s a versatile athlete who loves to hit, played a high level of high school football week in and week out in Atlanta and, most important of all, he just strikes me as a football player. I think he’s going to be really good. MB: Garrett Snodgrass because he’s from my hometown, plus I’m partial to in-state guys. Of course I’m interested to see Robinson because of all the talk about him. And Noa Pola-Gates. JP: Be honest, Brandon: you just like Farmer because his name is “Farmer” and he’s going to Nebraska. But, like Mike, I’m partial to in-state kids and I already know Nick Henrich, Chris Hickman and Garrett Snodgrass a bit, I’ve interviewed Ethan Piper and enjoyed it and Garrett Nelson sounds awesome from everything I’ve heard. As for out-of-state kids, Wandale Robinson is an obvious one but I like what I’ve seen from Jamie Nance as well. DP: Wandale is going to be special. Bryce Benhart is my other pick. With the proper development, he looks like a future Sunday guy. ES: Putting your name into the transfer portal is a risk regardless, but it’s definitely more risky if you’re already intending to leave the school you’re at. You’re essentially putting all of your eggs in one basket. However, if you’re ready to leave that program and move on, it may make sense to just get the ball rolling. In the case of someone like quarterback Andrew Bunch though? He clearly wasn’t sure if leaving was the right decision and just needed the chance to look around. It made sense for him to stay enrolled, take the time and make the decision that was ultimately best for him. BV: It feels crazy, but maybe it was to be expected that the combination of THE PORTAL plus an early signing period has really cast everyone into an almost totally new model of roster construction. I thought it was interesting that Frost, in his Wednesday press conference, was already stressing the importance of keeping the players they’ve hand-picked for their team. That, too, might be an obvious need, but I haven’t heard many coaches talk about it yet. They’re all trying to figure out (to some degree) how to restructure their recruiting calendars while also having this new delivery system for experienced players. But to address your actual question, yes, I think it would be better to stay in school while in THE PORTAL, though that’s probably not perfect either. Even if you stay at your current school, there is the potential perception that you wanted something better but didn’t find it. From what I know of the Bunch situation, I think he was pretty transparent about wanting to see what his value was to potential suitors and that decision was made with the understanding that he could come back. That’s the way to do it. GS: I don’t think this is a crazy notion. If Nebraska can land both Turner Corcoran and Nash Hutmacher as they are trending towards now, that’s a great start. There are a number of Missouri, Iowa and Colorado players on the lines with Husker interest. That’s before Nebraska starts grabbing guys from Georgia and Alabama. There is a chance but the skill guys this year are a deep and talented group. You’d be hard pressed to find a guy not to like. JP: I wouldn’t sleep on this year’s haul on the lines, but it does seem like Nebraska has positioned itself well to make some big moves in the trenches in the 2020 class with how strong the talent is in the 500-mile radius. The Huskers have put themselves in good position with guys like Turner Corcoran on the offensive side of the ball and Nash Hutmacher on the defensive side in addition to a handful of others. 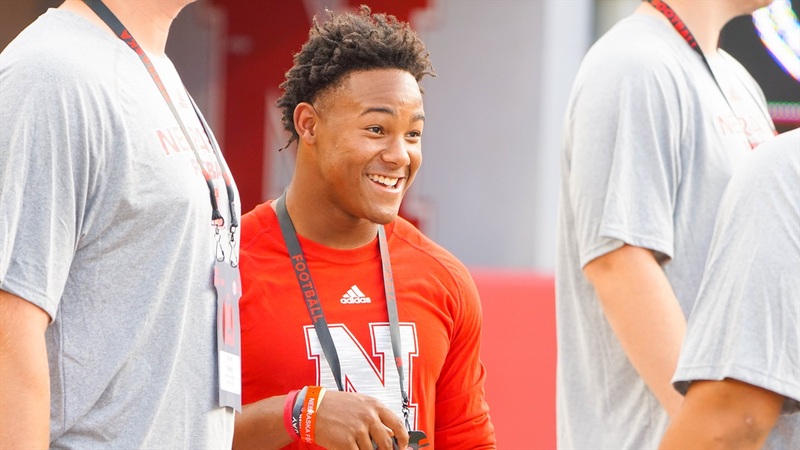 Wandale Robinson is the gem of this skill group, but Jamie Nance, Darien Chase, Demariyon Houston, Dedrick Mills, Rahmir Johnson, Ronald Thompkins and Chris Hickman is a really solid group and if Nebraska’s can top that on the lines next year, this rebuild should be well ahead of schedule. GS: The last I heard, he was coming along well but not 100 percent yet. That’s not unexpected. There isn’t a reason to rush him now and risk not having him full-go by the fall. GS: I’ve not heard anything bad about Tannor’s health. I expect him to make a huge jump this season. ES: Didn’t Tannor join Maurice Washington for one of those dorm dancing videos? Or am I making that up? If so, maybe we just go watch the video and see if we notice any potential health concerns. Welcome to the offseason!